Students walking into a polling place during the student unionization election last month. 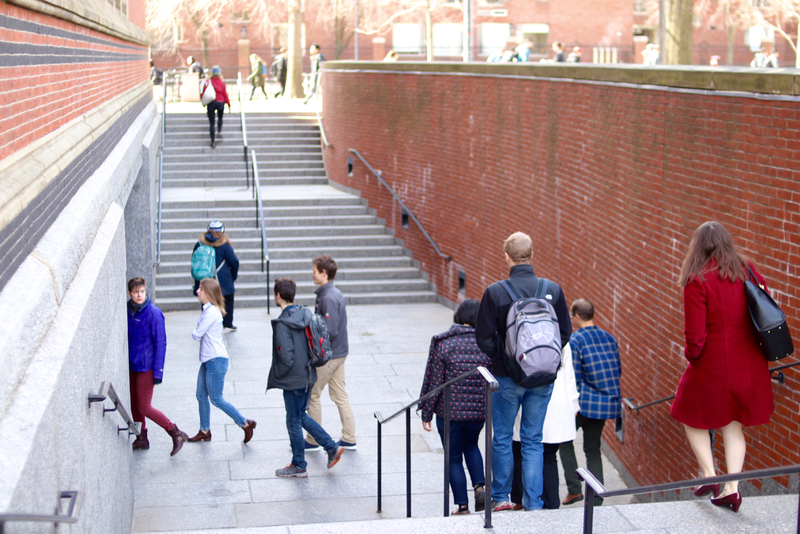 Labor experts say the boundaries delineating issues allowed on the bargaining table for Harvard’s newly formed graduate student union could differ significantly from those that define a typical labor contract negotiation. In Tuesday announcements that Harvard plans to bargain with its new union, University Provost Alan M. Garber ’76 and University President Drew G. Faust both noted University administrators plan to enforce a distinction between academic and labor issues when negotiating with Harvard Graduate Students Union-United Automobile Workers. “We will be very adamant about differentiating between matters that are appropriate for academic decision making from matters that are concerns of a labor or employment situation,” Faust said in an interview Tuesday morning. According to University of Michigan law professor Kate E. Andrias, the National Labor Relations Act makes a distinction between issues employers must bargain over and issues that they can choose to include in a contract. Andrias wrote that topics usually considered mandatory include wages, overtime, grievance procedures, arbitration, safety and health, changes in work assignments, and non-discrimination policies. But she said the University could propose to maintain control over some or all of these issues by including a "management rights" clause in their contract with Harvard Graduate Students-United Automobile Workers—a provision asserting the power of the employer to oversee all matters not included in the contract. In an email, University of Oregon professor Gordon Lafer, who formerly served as a senior labor policy advisor for the U.S. House of Representatives Committee on Education and Labor, wrote he thinks the University’s commitment to draw a firm line between academic and labor issues may be unusual. “There is not a single case of an academic union insisting on bargaining over grades, letters of recommendation, awarding of honors, tenure criteria, what fields of specialization a department should concentrate in, admission criteria, or any other academic judgment,” Lafer wrote. This commitment could be considered “suspicious” if administrators were to expand the scope of what they consider to be academic judgments, according to Lafer. Former National Labor Relations Board Chairman William B. Gould IV said the commitment to keep academic issues off the table is impossible to interpret prematurely. “The demarcation lines, if they choose to draw them, would probably focus on these kinds of considerations: the way in which examinations are graded; lecturing, the duties and obligations of lecturers; and the ability in the case of research assistants for faculty to unilaterally determine their mission and the instructions that are associated with it,” Gould said. “But I don’t know what the issues are and which might arise,” he added.